Curated ideas for personalized business gifts. As with any business, you are always trying to get an edge over the competition. One such way, among many, is to use corporate gift giving. Doing so can increase sales and help brand your business. The idea of corporate gift giving to clients has long been debated; however, experts would largely agree that customized corporate gifts are now a must for any business who wants to retain their current client base. We have previously discussed the importance of giving corporate gifts, but want to take the time here to focus more on corporate gifts specifically for clients. It is such an important part of what a business must do to retain customers that many companies have developed programs specifically for corporate gift giving. So why should you be thinking about the best corporate gifts available for clients? Having a program designed to give corporate gifts to clients can also help retain current customers. According to ASI, it is cheaper to retain current customers than it is to obtain new ones. Focusing more of your advertising budget on customer retention is a great way to increase your bottom line. So, other than retaining customers, what are some of the main reasons to implement such a program? A personalized gift can reinforce your brand’s image. Shows customers they are not just “one and done” and that you actually care about them. It’s something your competition is not likely doing. Makes clients feel a more personal connection to you and your brand. Reciprocation is also a great benefit. When a customer receives a gift from you, they feel more obligated to purchase from you than your competition. 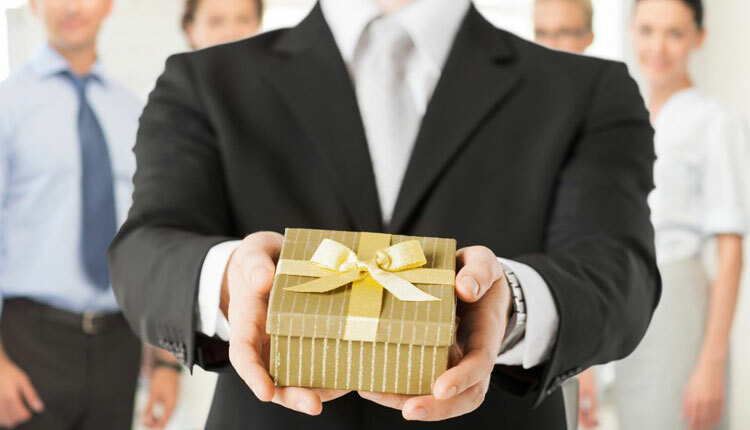 With these in mind, what are some best practices to corporate gift giving? If you are simply looking for an opportunity to put your logo in front of someone, you are not really giving a gift, you are promoting yourself. The benefit of a brand impression should be secondary in your mind. Make something personal for the client. Don’t just send them something generic you send to everyone. “When” you give the gift is just as important and “what” the gift is. For instance, clients may not be as impressed when you send a gift on Christmas as opposed to their birthday. Many people see Christmas gifting as routine so the impact is not as great. Pick a time that is personal to them such as the anniversary of their business opening or something else important in their life. The best corporate gifts come at random times. But, giving a personalized gift can also have a huge impact. Here is what I mean by personalized gifts. When I talk about personalized gifts, this means something personal for the person receiving them. This could be as simple as adding their name in embroidery on a name brand polo shirt. It could also mean putting their name next to your logo on a Titleist Golf Ball. People who receive a gift that is personalized will be more appreciative than those who don’t. When you think about it, we are not talking Rocket Science. Wouldn’t you like it if someone gave you a gift personalized for you as opposed to just a generic item with a logo on it? So what are some of the best corporate gifts that incorporate personalization? Why exercise and fitness gift items? Well, people are either healthy (in which case they are using these items), trying to get healthy (same as the previous), or want to get healthy (which means they plan on using these items sometime in the near future). Regardless of the reason, exercise and fitness items make some of the best corporate gifts for clients. If you are not sure what specific item to get, a safe bet is to go with a pedometer. A pedometer is a device that counts a person’s steps based on movement of their body. It is able to calculate the number of steps a person takes over the course of a day which can provide beneficial feedback on their exercise goals. People are increasingly use pedometers no matter what their lifestyle. It is great for those trying to maintain health levels while also showing others how much they actually do (or don’t) exercise throughout the course of a day. Customized sport towels – Your brand will be in front of a person for the duration of time they work out. Exercise apparel – People need to wear workout close when they exercise. Why not put your brand in front of them and everyone else at the gym? Think about it….brand impressions! Fitness equipment – Everything from bags, ropes, and mats are available for customization. This is also something you can personalize by choosing the right piece of equipment specific to the person you are giving it to (e.g., giving a yoga mat to someone you know regularly partakes in yoga). As always, you can contact our sales team for more ideas on exercise and fitness gift items. Let us help you select the right item for the right client. Electronics are always a hit. We live in the age of technology so people are constantly using items that you can customize and personalize as part of your corporate gift giving program. Custom Amazon Echo Dots – They make up two-thirds of all smart speaker transactions in the United States. People are slowing integrating these in their homes so those who have them get many questions. Image someone answering a question while also explaining they got theirs as a corporate gift from you. Custom Amazon Fire – One of the hottest e-readers available on the market. Imaging giving this to someone who travels and reads a lot but hasn’t quite caught up to the digital age. You will be the one they remember when they tell people about how they now read all their books electronically. Bluetooth Speakers – Another hot item that people are catching on to is custom Bluetooth speakers. No longer do you need to put your smartphone on the highest volume setting and get distorted sound. Simply allow a portable Bluetooth speaker provide a loud and clear sound of whatever you want to play. Wireless Chargers – Of course these make a great gift. How many times have you struggled to get to your charger in time before your phone went dead? You’re not alone, your client has done the same thing. Custom wireless chargers are a useful and thoughtful gift. Of course these are only a few ideas to help jump start the thinking process. You can always reach out to us by email or telephone for additional information on the best corporate gifts for clients. Electronics and exercise items are not the only things you can use for corporate gift giving. Here are a few additional ideas that are likely to get your clients’ attention. Coolers and misters – Maybe your client lives in a hot and humid area. Giving them a customized mister is perfect for them. Yeti coolers – If your client is a fan of camping, fishing, or just an outdoor person, a Yeti cooler is an option. Anything Apple – People who use Apply products are really fanatics. They love their Apple gear and won’t even think about buying anything else. Regardless if it’s an iPad or custom AirPods, there are great gifts available for any Apple fan. Zippo lighters – Anyone who uses a lighter on a regular basis knows that Zippo is the cream of the crop. A Zippo has more status than any other lighter on the market. A client who receives a Zippos as a gift will know that you truly care about them. Have an idea that you think will win over your client? Give us a call and we can tell you the best way to customize it. Adding a corporate gift giving policy to your company can help increase your bottom line. It costs less to retain current customers and giving them personalized gifts will make them more likely to purchase from you than your competitors. Make sure you take the time to think about the recipient instead of just giving them anything. Make it personalized and give it at an unexpected time. The less a client expects it, the more they will appreciate it. Finally, don’t hesitate to reach out to us for any questions you may have about the customizing process or for additional gift ideas.